When you have been blogging for several years…or even several months…there are things that happen to your articles that will decrease your traffic and make you less money over time. Old articles are going to start to drop in search engine rankings if not cared for and affiliate links will change or go away completely has companies come and go from affiliate networks or go completely out of business. It is your job, as the blog owner, to stay on top of these as your blog continues to grow so you can make sure you continue to build a strong reputation online. While everyone might have their own strategy for handling this situation, here is how I attack each issue on a quarterly basis on my blogs. If you aren’t already, you should be using Google Analytics to track your blog’s traffic, entry points, keywords, etc. With Google being the largest search engine on the planet and Google Analytics being as comprehensive as it is and free…it is a no brainer. Once, at the beginning of every quarter, I go into Google Analytics with one primary goal: Grabbing a list of my bottom 100 performing posts in search engines. From this list of 100 articles, you now have your worst performing articles in Google and other search engines online, so it is time to get to work. I start to go down the list and mark articles that I think need to get some love. Now, not all of the articles on this list need to be edited as some are ok down there and are not too important. However, as you go down the list, you will see articles that need some serious help. What do I do with these low performing articles? There are several things I do with these low performing articles to get them back up to speed. SEO optimize the article with Scribe – Scribe is a paid SEO optimizer that you probably don’t have. I didn’t believe in it at first but it has done fantastic things for Bike198.com over the past couple of months and by using it…I have been able to jump up results dramatically in certain areas. Make sure all affiliate links are setup correctly – If you bring more traffic to these articles, you better have your monetization setup correctly. Now is the time to do that. Write a list of articles to link back to – After I edit up the article, I write it down on a list. This list is a selection of articles that I need to link to in future articles to get them re-spidered and indexed more efficiently. And that is it! When I keep this cycle going, I am in constant rotation of keeping article fresh and income coming into my blogs. As I mentioned before, affiliate links can change over time so you can be leaving money on the table and not even know it if your readers are clicking a link and getting no where. I optimize and check my affiliate links in a two stage process that seems to work really well. The only way to really find out if your links are broken or hitting the wrong page is to click them. When I first started blogging, this was an extremely cumbersome task as I had to go through each article, find the links and change them if necessary. As you can imagine, as your article count goes up, so does the amount of time and work this takes. Luckily, these days all of my affiliate links are located in one place in a list with the Ninja Affiliate Plugin, so I can go straight down the list, clicking each link and making adjustments as necessary in an hour instead of days. The next thing I do is head right back to Google Analytics and sort that same low performers list as a high performers list in search engines. From this list, I go down one by one and make sure I am monetizing each article correctly. Over time, I have become better at monetizing articles, so by going back into each, I can use my new techniques to squeeze more money out of each article. Most of my top performing search engine articles on Bike198.com center around reviews, tips and tutorials, so taking this extra step goes a long way in increasing my blog’s bottom line. You might have also picked up a new affiliate program that pays a higher commission or offers products and services that are related to that article that you did not have before. This is the time to make those edits as well. The tendency is to want to watch these items on a weekly or even daily basis to make sure you are not leaving anything on the table. However, nothing changes over night and obsessing on this will take you away from your primary goals of content production and promotion, so limit these tasks to a quarterly or bi-yearly basis to make sure you are headed in the right direction. Next ArticleWhat Does Your Blog's Tagline Say About Your Blog? I never thought about refreshing posts with more search engine traffic. I will work on adding some affiliate links to some of my posts with more search engine traffic. I have never tried Ninja Affiliates. However, if you don’t have a large number of affiliates, you can setup a 301 redirect for your affiliate links. Super easy if your hosting company has a cPanel. The actual links in your blog post never change. Just the links in your redirect. Bonus, the links don’t look affiliate-ish. Ninja Affiliate makes it stupid simple and efficient. It is all handled in your WordPress admin. I have it installed on all of my sites. I also use it to brand my Twitter links, Facebook links and anything else. On top of that, it tracks the clicks right in the admin. Another thing (I couldn’t see that you mention it) is link from your old posts to some of your newer ones. Very true. Thanks for adding that in Andrew. These are a couple of excellent tips that I never thought of doing. I am still new to all this but WOW, this are some fantastic tips. I am definitely going to have to check out Scribe and the Ninja Affiliate plugin. I never thought too much about affiliate links changing over time so I could be losing money as we speak. You also make a good point about checking these once a quarter. There is no need to obsess over this on a weekly basis when I could be more productive in other areas of my business. Thanks Rick. I used to be an obsessive stat checker and that takes a ton of time away from more productive blogging activities, so by setting a schedule…I can real in that OCDish behavior and get things done. Good point about refreshing older articles Robb. I’ve never rewritten any of the content on mine and it’s something I should probably do. I’d be really curious to see what affect it has on my search engine traffic. A positive one for sure. Especially when you combine rewriting/editing with interlinking with new and old articles…you will see a nice push forward. 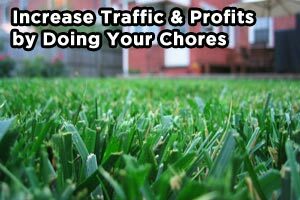 This is an eye opener for me to go to my old, low traffic and low income pages and optimized them to get more traffic and increase my income. I bought Ninja Affiliate plugin recently and I’m using it now for my affiliate marketing.